Rithwik is a 2 year old boy suffering with a rare genetic disorder called Metachromatic leukodystrophy due to saposin-b deficiency. Stem cell transplantation would be the curative option for this disease. Hi I am Madhavi. I have two kids. My first daughter passed away on 19th may due to metachromatic leukodystrophy. This disease progressively worsened. The children who suffer with this disease lead normal lives upto 2 years. Only after 2 years do the disease symptoms start. After these symptoms began showing up, the children lose their motor skills, peripheral neuropathy, hearing, speech, vision, have seizures, can't rollover, and are suddenly completely bedridden. I know how horrible this disease was. I faced it first-hand with my daughter. I don't want to Rithwik to go through the same ordeal, in such pain and suffering as a 2-year old baby. I have admitted him for urgent treatment on 17th May. Before May 17th we completed pre-evaluation (MRI,BERA,ERG, X-RAY, ULTRA SOUND, ECHO,BLOOD TESTS and URINE TESTS) for Bone marrow treatment. At the time of my first daughter's diagnosis, my second child Rithwik was 1yr old very healthy and active. 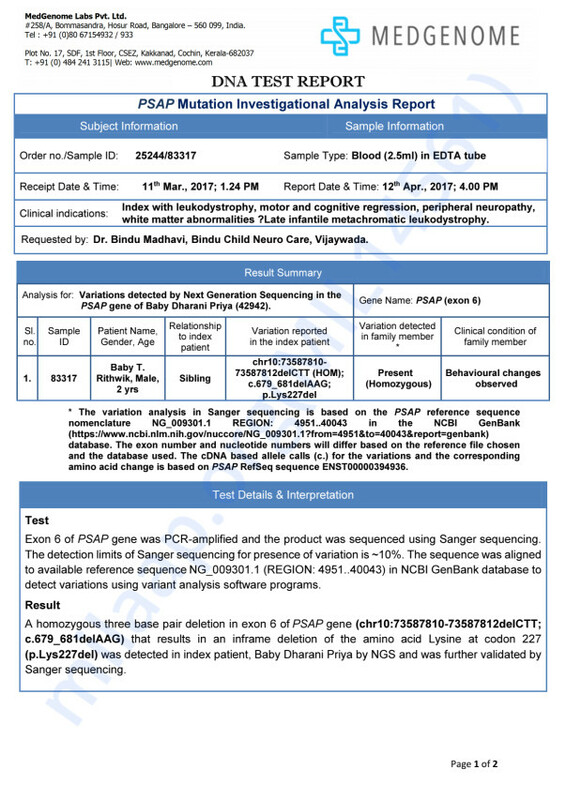 I did a genetic test for my son in the month of March at the age of 2yrs. Unfortunately, the report came positive. He also had the same disease. Its just that the disease symptoms had not yet started for my boy. For pre-symptomatic kids, the only cure is stem cell transplantation. Usually sibling Stem cell use for this disease. But Rithwik sister passed away. My husband and I are also not considered as matched donors to be able to donate cells to my son. 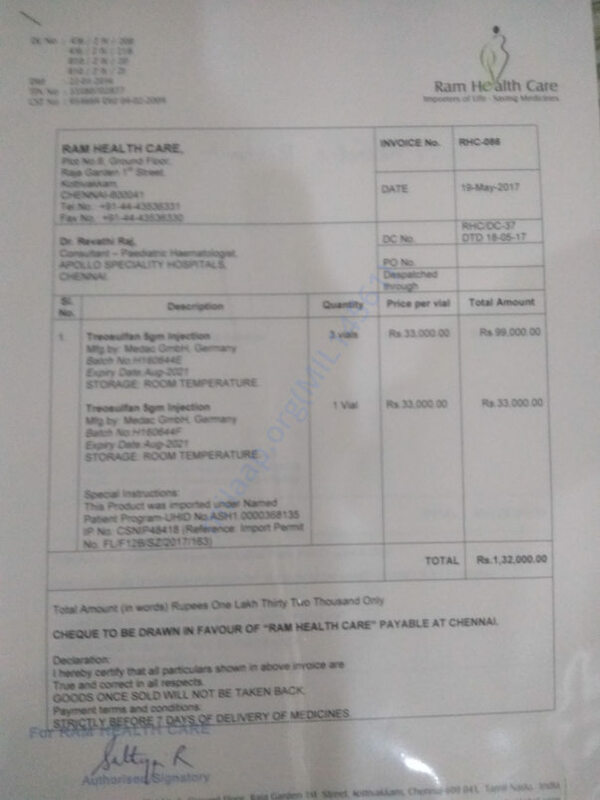 We therefore have a unrelated donor, and need to a much larger amount to him.We need financial assistance of Rs.25 lacs for this treatment. We are under the guidance of Dr. Revathi Raj one of the famous bone marrow transplantation specialists in India. 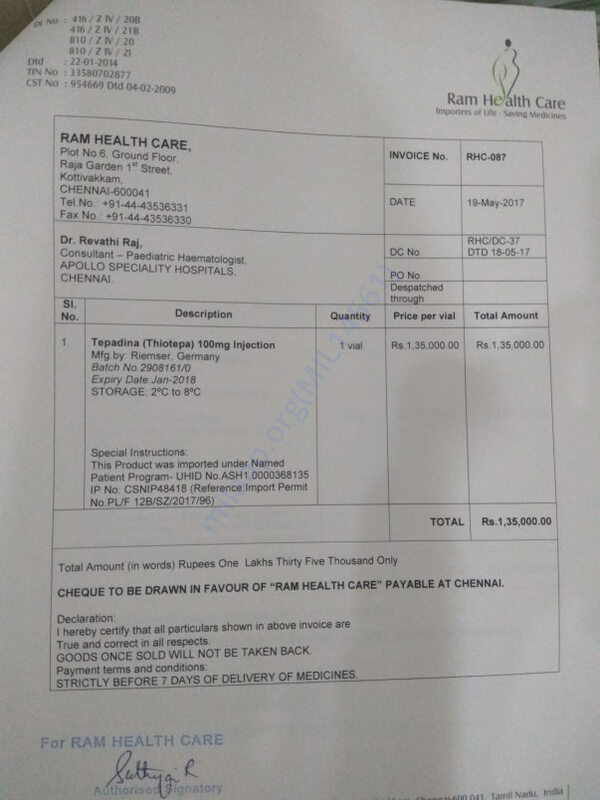 We are taking treatment in Apollo Specialty Hospitals Chennai. 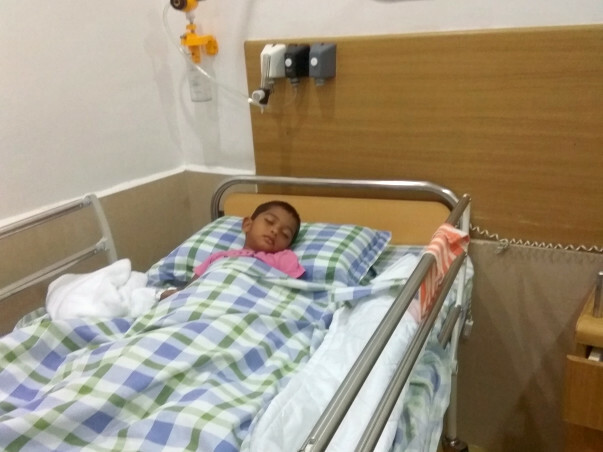 We need help to save my child. Already I can't save my first child. I have spent a lot of money for Dharanipriya but we can't stop her symptoms. She is under good medication to extend her life time. She suffered with this horrible disease for 2 years 3 months. 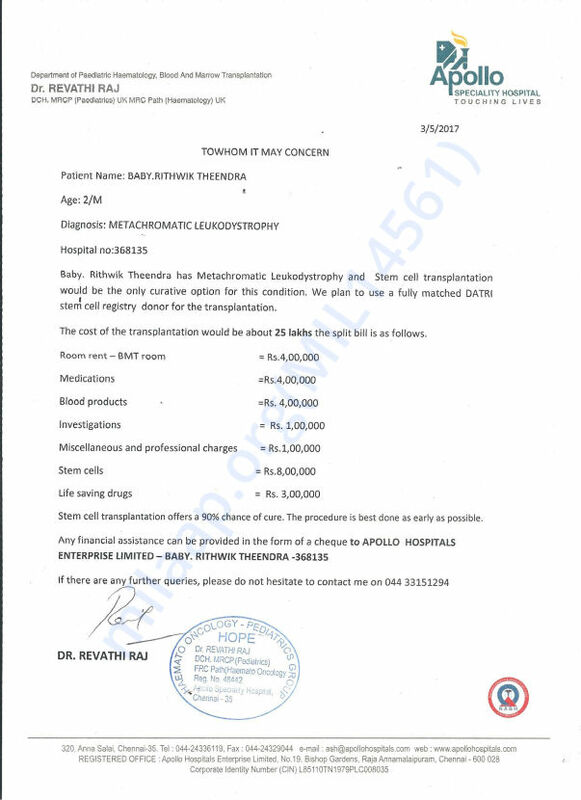 I want to give life to my second baby.This is the first case in India they are doing bone marrow transplantation for this disease. If this clinical trial will successfully complete, it will give way to many others suffering with this disease in India. Please help Rithwik. We consulted doctor on 15/12/2017. Rithwik is doing good treatment wise. No serious side effects after stop some life saving drugs.Now he is OK without medicines. Neurological checkup also done for him. Still he able to walk,talk,speak and listen. No further deterioration neurologically at present. We will go for next MRI in the month of may to observe changes in the whitematter of the brain. Thankyou for your support and blessings. We attended the second visit on 06/10/2017. All blood reports are normal. He is doing good. They changed medication dose to check his response towards the treatment. Usually, some children get GVHD symptoms. We have to see how Rithwik will respond. Thank you all for your kind support. Please do pray for his health. Rithwik first monthly visit completed on 01/9/2017. He is doing well treatment wise no issues and no side-effects. 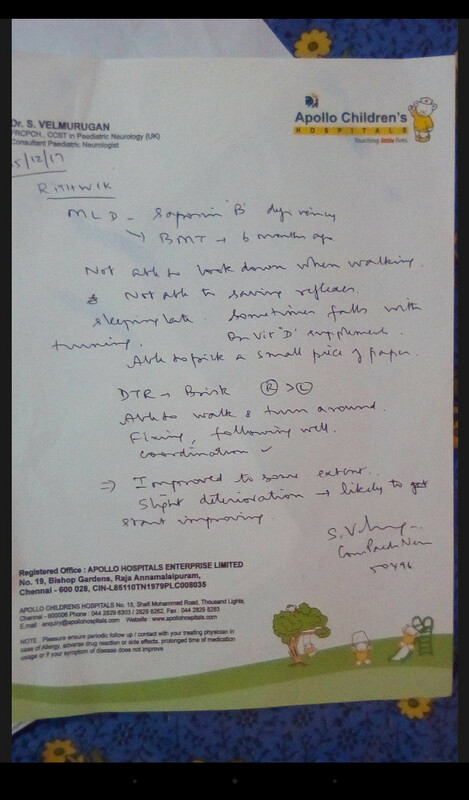 He had neurological symptoms started they are teeth grinding and intermittent falls while walking. The doctor told us the above features can be observed and presently do not warrant any specific intervention and the new stem-cells will take 6 months time to reach the brain to stop demyelination progress. Will keep you posted.